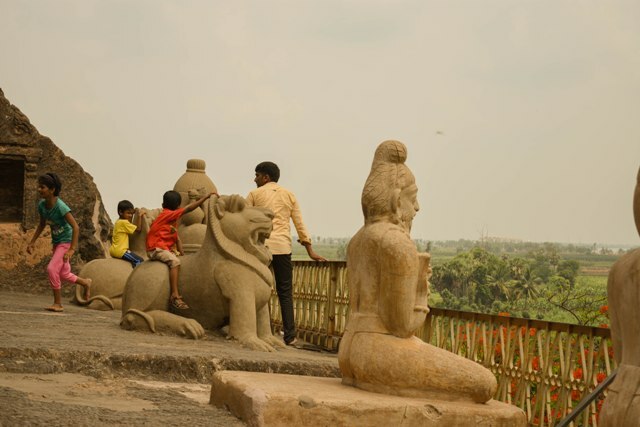 Wondering what to see in Vijayawada, Andhra Pradesh?? Take a minute or two to read till the end. You won't be disappointed for sure. Though its a big city many people doesn't know about the interesting places in the city. Our plan was to travel to an offbeat tourist place. But the city spread along Krishna river, mesmerized us with its beauty. 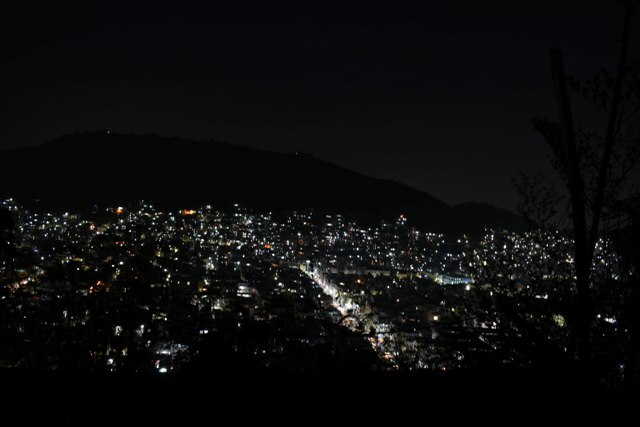 Several small and medium-sized hills in Vijayawada are the continuation of the Eastern Ghats. 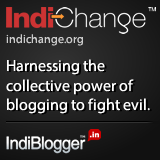 It is a perfect weekend getaway from Hyderabad. Vijayawada is well connected by train and bus from Hyderabad. An overnight journey of 6 hours in TSRTC bus will cost you around Rs.400 per head for a non-ac semi-sleeper. If you reserve the seat in train beforehand the travelling cost will be even lesser. We went around for a short walk in the morning just after getting down from the bus. We headed to Krishna river with the help of google map. But there was no sign of a river. Summer has done its part in drying up the river. 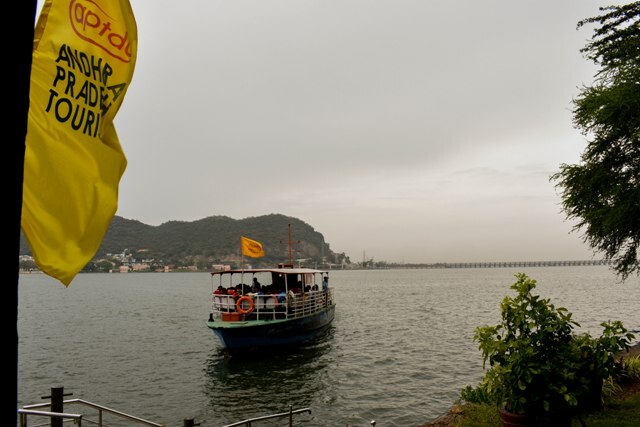 June is not the best time to visit Vijayawada. Best time would be just after the monsoon ends, October to February. After having a cup of hot tea to freshen up from the last night dizziness, we started for hotel room hunt. Accommodation options are plenty here. A big number of hotels and lodges are available just opposite to the main bus station of Vijayawada. We took a non-ac double bed room which cost Rs.650 per day. They will tell high rates, but you have the option to bargain. As there are a bunch of hotels available don't just settle-in until the room meets your budget and requirements. Ours was a two-day plan to explore the city relying mainly on public transportation. Did I mention Vijayawada bus station also known as Pandit Nehru bus station is one of the busiest and biggest bus complexes in Asia!! We freshened up and by 9.00 AM we were ready to venture out Vijayawada. Our first destination for the day was Undavalli caves. It is in Guntur district at a distance of around 7 km from the Vijayawada Bus station. We hired an auto which costed Rs.120. 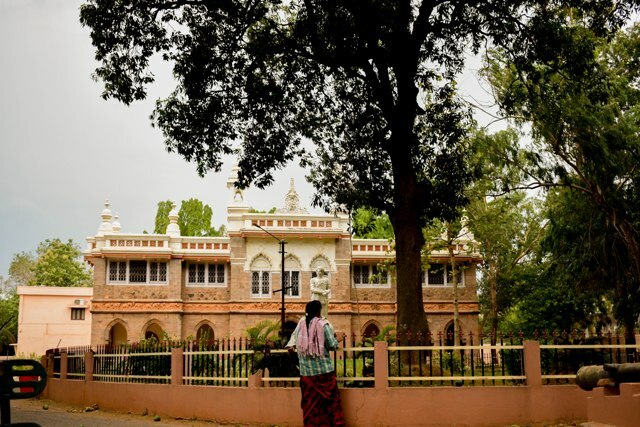 This is one of the best place to visit in Vijayawada, if you are interested to indulge in a little history. It is a small four-storeyed cave carved out of sandstone rock in scenic surroundings. 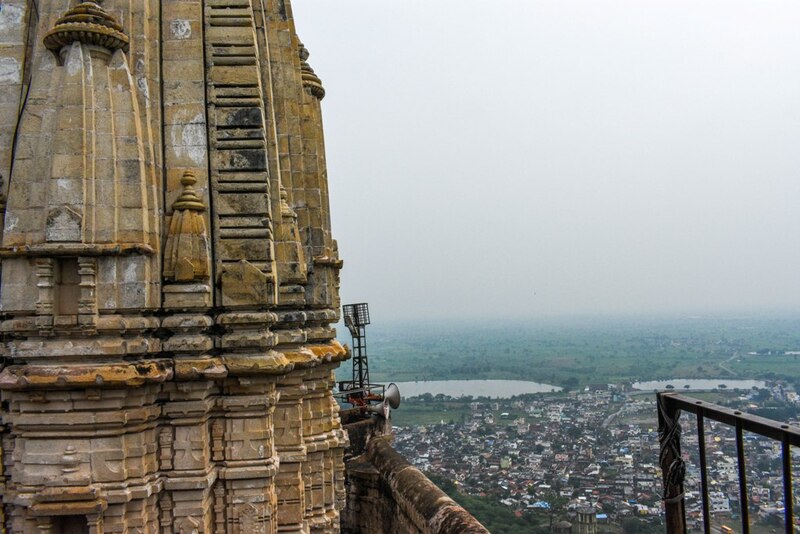 These architectural marvels were made in 4th-5th century and have survived through centuries. Earlier it was a resting place(Viharas) for Buddhist monks in monsoon times. 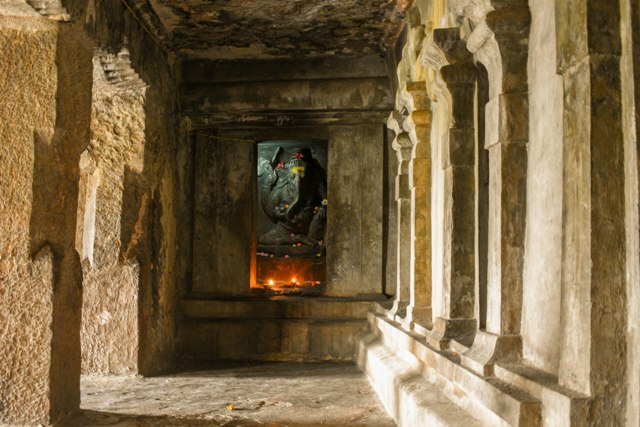 Later the cave was taken over by Hindus. 25 feet long Vishnu carved out from monolithic granite rock.. Does it resemble Buddha Somewhere?? 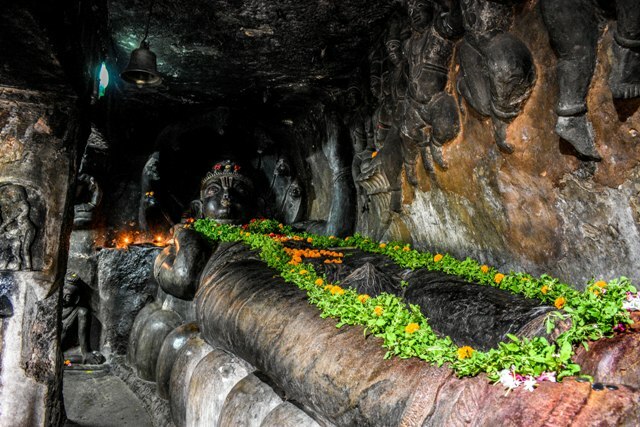 I read somewhere that the reclining Buddha was converted into Vishnu which is now seen in the cave with addition of some features to the earlier version of Buddha. There are no description boards or guides around, one has to explore the cave by his/her own. 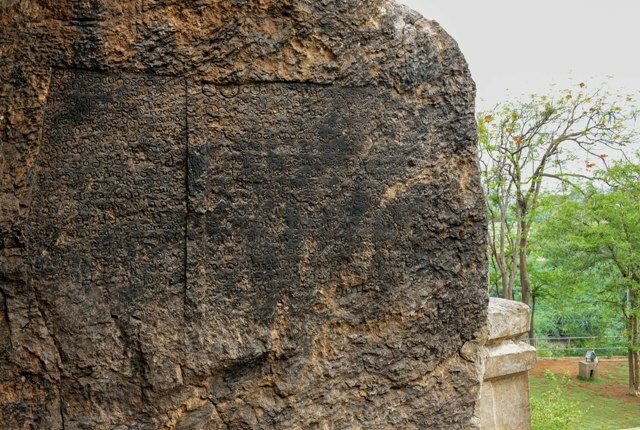 It is a Telugu inscription carved out on the rock which I couldn't read it.. If you know what it is share with us.. Though it was a cloudy humid day we enjoyed sitting there overlooking the village for a while. You can get a bus back to the bus station, which cost you Rs.20 for each person. There is no official bus stop there, but they will stop on request. 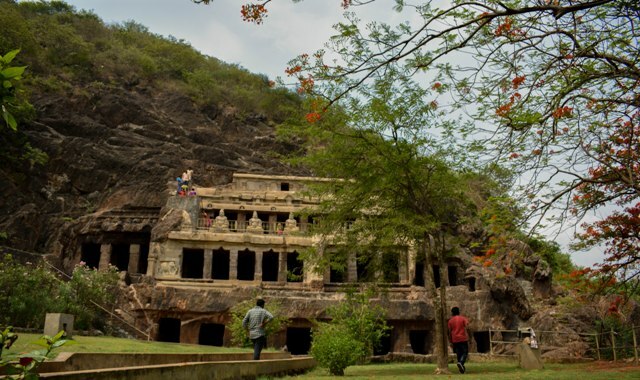 Timings to the Undavalli caves is from 9 AM to 5.30 PM and Entry charge is Rs.15 per head. Ps: Beware of monkeys. They were a little wild. 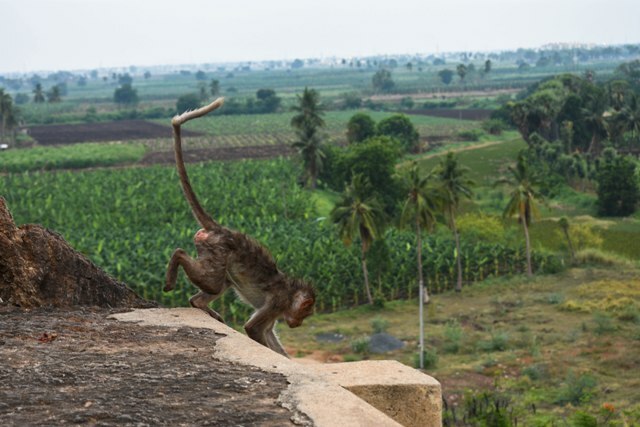 We witnessed monkeys grabbing water bottles from the visitors hands. It's better to keep food items in the bag. Our next destination was Moghalrajpuram caves. We took a bus from Undavalli caves to the main bus station(Rs.20 per head) and from there another bus to Moghalrajapuram(Bus No.5). We told our fellow passengers to tell us when we reach our destination. But there was huge confusion among people about the exact stop to get down. I wondered why this uncertainty about the 2000 years old historic monument being in the heart of city. So we got down as someone said and started to walk towards the cave as google map guided. And finally we reached there. There was no sign of a historic monument there. It was surrounded by shops and houses nearby. One has to observe carefully, otherwise this spot will be easily missed as huge trees are covering this small cave. After reaching there, we met a person and he told us there are a total of 5 caves spread each at a distance of around 1 km. The one we ended up was cave no.3. This cave is on the top of a very small hill. The enthusiasm to see other 4 caves was gone after seeing this one. My personal suggestion is to skip this one, if you are not really interested in history and stuff. So we headed to our next destination Victoria museum aka Bapu museum. We hired an auto to the museum which charged us Rs.40. 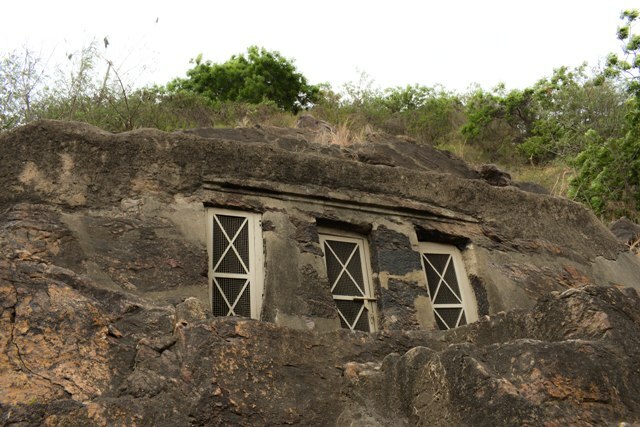 We could see one of 5 Moghalrajpuram caves on the way to this museum from auto. This archaeological museum located on MG Road have a large collection of sculptures, paintings and artefacts of Buddhist and Hindu relics. But to our much disappointment, the museum was closed for renovation. But we had a peek into the sculpture museum. 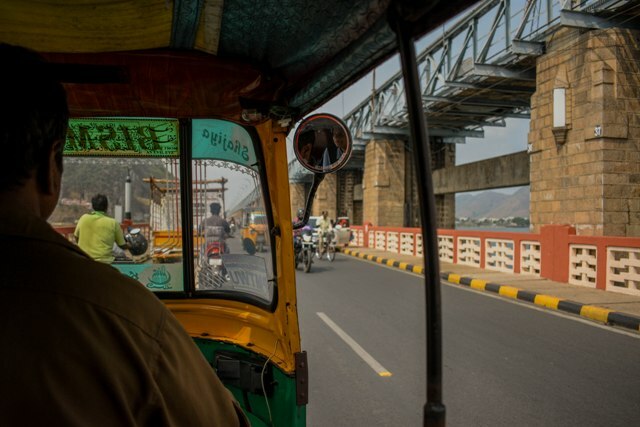 Bus routes in Vijayawada are organized in such a way that, wherever you go in the city, you will get the bus back to the main bus station and from the main bus station you will get the bus to anywhere in the city. That might be the reason it makes it one of the busiest bus station as I mentioned earlier. So to catch a bus to our next destination, Bhavani Island, we came back to the Bus station. When we asked about the bus to Bhavani island, people were giving different directions. Hence cancelled the plan to go by bus and hired an auto which charged us 100 Rs. It is one of the largest river islands in India. One has to come to the Berm Park first and have to catch a boat to the Bhavani Island. Entry fee to the Berm Park is Rs.10 per head and the ferry charge to reach the Island is Rs.60 per head. It is one of the best place to hangout or to spend a day. There are a wide range of options to indulge in. You can just sit enjoying the view of Krishna river. 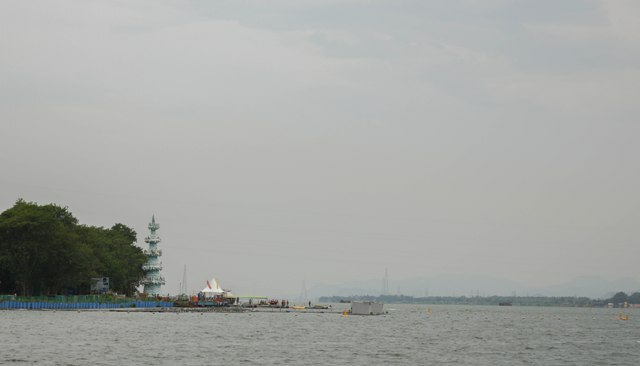 or you can try water rides in ski boat, jet boat, pedal boats, banana boat, swan boat rides, bumper ride if you are a water sports adventure freak. 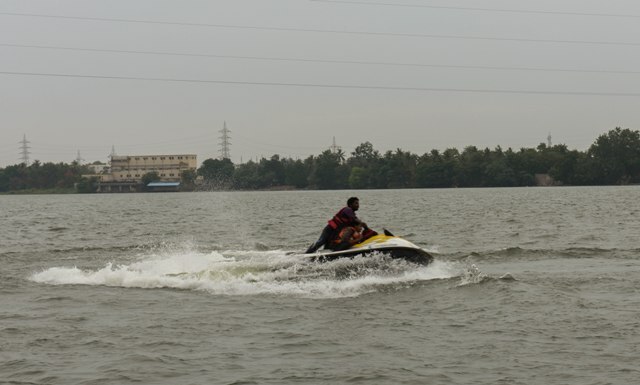 We tried Ski boating which costed Rs.450 per head. 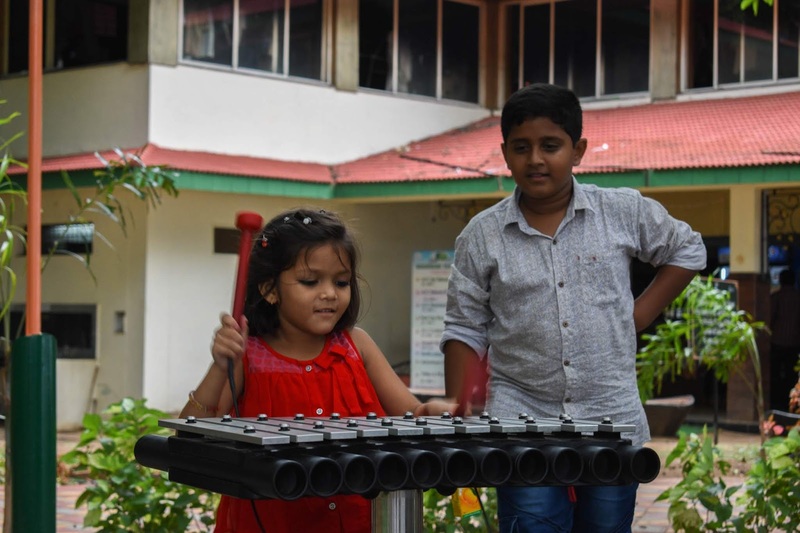 She was nicely playing the xylophone which was in the Kids playing area.. Kids will love the place as there is an exclusive zone for kids to play around. Who would like to stay on the tree top?? 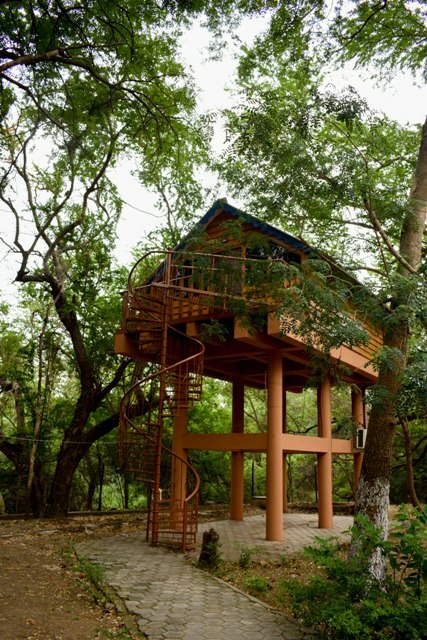 If you want to spend a day you can book a tree top house provided by Haritha hotels. They also run a restaurant, but the food rates are a bit pricier than what you get in the Vijayawada city. We were drenched in water after taking a water ride in Bhavani Island hence had to go back to the room. So after freshening up, we started to our last place to visit on the list. Thinking Gandhi hills is very nearby from the place we stayed in, we started walking. Though it was only 2 Km away from the bus station, we felt like walking for ages since we were tired. We did a mistake by not hiring an auto and by the time we reached there it was dark. Gandhi hills is near to the Vijayawada railway station. A Gandhi memorial is built up on the hill which having 7 stupas(pillars). We missed seeing it, as already it's been dark and there is no proper lighting near the memorial. There is a library and a toy train. It was closed by the time we reached. A person was there with a telescope. He showed us Kanaka Durga temple, Masjid in Guntur and some more places with a small charge of 10 Rs. Kids may like this. 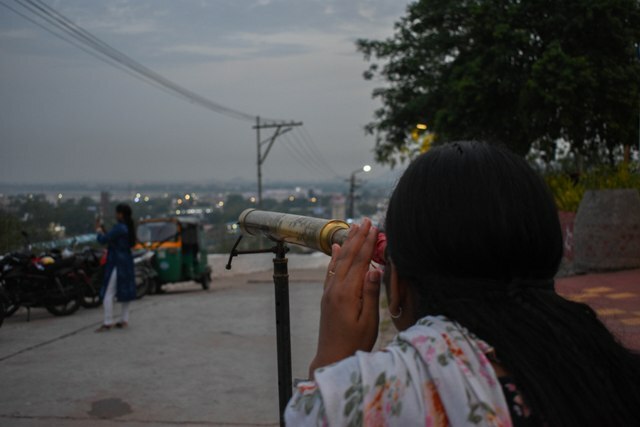 Buy an icecream or two in your favourite flavour from the shop that is on the Gandhi hill as we did and enjoy watching Vijayawada as the daylight fades away and the city light fades in. Entry charge is Rs.10 per head and timings is from 4:00 pm to 8.30 pm in the evening. We took a bus back to the main bus stand from the railway station. As our energy was drained out completely, we didn't bother to search for restaurants. We went to the canteen which was on the 2nd floor of the bus station. We had tummy full traditional Andhra Thali for just Rs.80 with unlimited curries.